We are excited to welcome Loren Barrigar and Mark Mazengarb back to the TCFA stage. Drawing on influences from jazz to bluegrass, from Western to popular music, this fresh, lively duo will perform on Saturday, August 29, 7:30pm. After a year traveling the world and headlining at the Chet Atkins convention in Nashville, the pair is pleased to return to Trumansburg. Their exceptional guitar work, their vocal harmonies and high level of creative musical interaction has brought them wide acclaim. 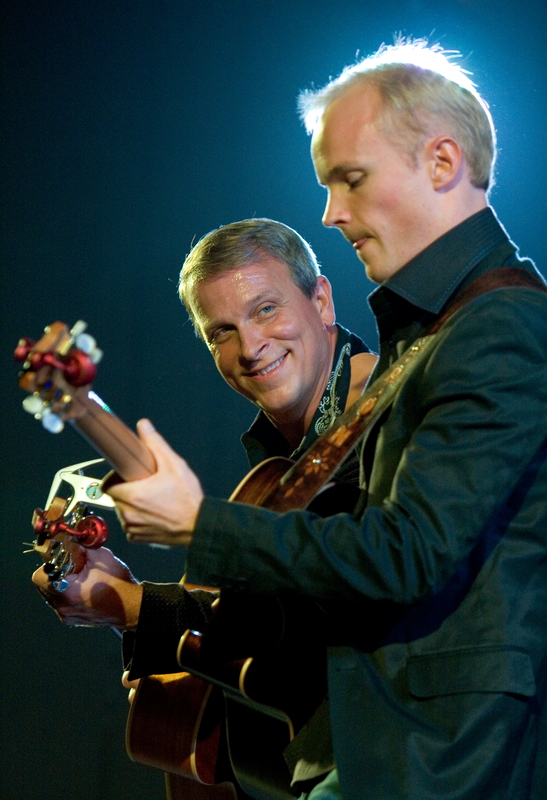 Mark is an internationally recognized player from New Zealand, and Loren was the youngest instrumentalist ever to play on the Grand Ole Opry. Catch a glimpse of their work in this short video. The word is, “This is guitar-playing like you’ve never heard before!” Don’t miss it! Tickets are $15, available locally at Good To Go in Trumanburg, at the Ithaca Guitar Works, and online thru Eventbrite.